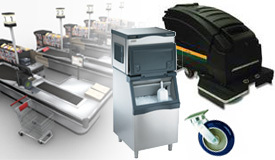 KASCO provides equipment maintenance and repair on the top brands in the industry. Our fully trained service professionals will ensure your equipment is running properly for maximum efficiency. Ice-O-Matic manufactures high-quality water filters for ice machines in a variety of food-related markets. For over 40 years, Pan-Oston has been a trusted manufacturer of grocery checkout and supermarket checkout lanes. Royston is a trusted leader in the design, manufacture and installation of first-class store interiors for the grocery, food service and specialty retail markets.